Earliest archaeological evidence shows that people from a variety of regions enjoyed a good goblet of vino as far back as 4000 BC. The Greeks enjoyed it so much that they even had a God dedicated to the winking brew; Dionysus. Though in present times wine is relegated to elite rituals, full of discerning noses and swirling glasses or just solitary bottle swigging to beat the blues in front of Netflix; wine surprisingly has had connections to religion as well. 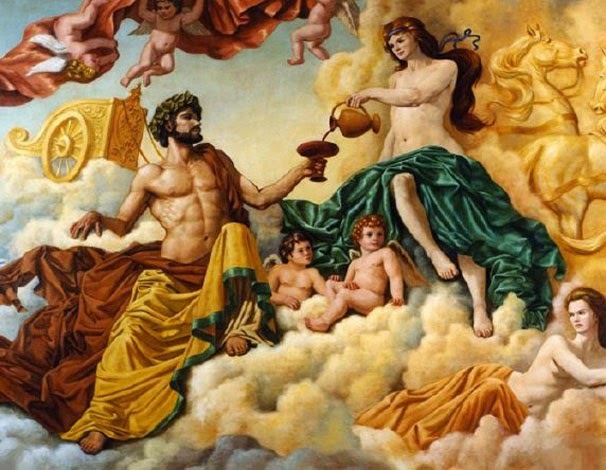 Dionysus, God of wine, fertility, revelry and religious ecstasy was worshiped while wine flowed in plenty and people indulged in a good old binging bout. Dionysus was also responsible for epiphanies, which could be related to reaching the divine whilst in a state of intoxication. Most are familiar with the Eucharist in Christianity which commemorates Jesus Christ’s Last Supper; however ritual consumption of wine is prevalent in Jewish practice as well since Biblical times. Apart from making us pick up pens in the middle of the night to write about that grubby caterpillar we saw on a window sill, a glass or two of wine has some serious health benefits which will get vino lovers cheering. Before you pour yourself an oversized glass of wine and clamber into a bathtub, these health benefits accompany moderate drinking only. By moderate drinking experts mean a 5 ounce pour of wine. This roughly comes up to a one glass for women and two glasses for men per day. Sorry ladies, it’s owing to the greater water content levels in men’s bodies. So pick up your glass for the day and read on about the numerous ways your lush vino is helping your body. Your grapey wine is more than just an accompaniment to fancy rinds of cheese. Apart from containing a slew of antioxidants, studies have shown that moderate consumption of wine boosts the immune system and helps ward off infections. The alcohol content in wine; ethanol, seems to increase the efficacy of vaccinations. However, excessive consumption would reduce the effectiveness of vaccines, so don’t binge drink. Many reach for a glass of wine to soothe their overheated brains after a long hard day but it has come to light that wine does more than just relax you. It stands guard against degenerative diseases such as Dementia and Alzheimer’s. A study conducted by Loyola University Medical Center found that moderate drinkers had higher chances of warding off Dementia. (Neafsey EJ, Moderate Alcohol Consumption and Cognitive Risk ) Though, it is seen that it contributes to declining memory in those who already have cognitive difficulties. Resveratrol present in both red and white wine produces ‘good cholesterol’ which prevents blood platelets from sticking to each other. This help keeps the blood vessels open and flexible, ensuring a good supply of blood to the brain. The chemical acetylcholine might also be produced due to alcohol which affects brain function and memory. Calcium supplements are probably what you’re taking to prevent creaky joints but research says a glass of wine would do just as well. Ethanol improves bone mineral density in both post-menopausal women and men. Wine specially contains phytochemicals which are great for bone health. (David J McLernon, 2012) Red wine has high levels of silicon which also contribute to bone mineral density. For those who just can’t stop themselves from ordering a cheesy large, devouring it whole and feeling guilty about the calories you’ve shoved into your body; take a glass of vino along with food. Arthur Agatston, MD cardiologist says, “Alcohol can stimulate the appetite so it is better to drink it with food. When alcohol is mixed with food, it can slow the stomach’s emptying time and potentially decrease the amount of food consumed at the meal.” (Zelman) We are guilty of pairing our Big Macs with a huge glass of sugary soda, replacing it with wine will ensure you’re consuming lesser calories. A standard 150 ml pour of red wine has 106 calories and white wine has 100 calories. The alcohol present in wine boosts production of HDL or ‘good cholesterol’ in blood. Since alcohol acts as a natural blood thinner, it breaks up clots and reduces chances of having a stroke. Wine also repairs some of the possible damage to the brain from a stroke. Researchers at John Hopkins University School of Medicine discovered that the resveratrol present in the skin and seeds of red wine grapes boosted levels of an enzyme called heme oxygenase. Higher levels of this enzyme protects nerve cells in the brain when a stroke occurs. Owing to the way red wine is prepared, in contact with the skin of grapes, there are higher concentrates of resveratrol present in red wine. This being said, it is imperative to note that excessive alcohol significantly increases the chances of a stroke. Moderation is key here. Diabetes plays the party pooper in a lot of ways, mostly restricting you from your favourite sugary foods. But there’s no reason why you can’t enjoy a nice glass of wine. In fact, you might even benefit from it. A study has revealed that the drink decreases cardio metabolic risk. The ethanol present in wine metabolises glucose and the nonalcoholic constituents of wine may help in the process. (Mr. Gepner, 2015) Resveratrol in wine increases the body’s sensibility to insulin. Again, this isn’t free license to start swigging from the bottle, drink in moderation. Though the International Agency for Research on Cancer of WHO has classified alcohol as a Group 1 carcinogen, researchers at Harvard Medical School found that men who drink four to seven glasses per week were only 52% as likely to be diagnosed with prostate cancer as those who did not drink red wine. Red wine proved to be protective against aggressive cancers. After evaluating relations between alcohol consumption and risks, involving different kinds of alcoholic beverages, they found that drinking red wine decreased risks of having prostate cancer. Red seemed to be more effective than white wine and even small amounts of wine helped. For every additional glass per week, risk reduced by a relative 6%. (Attention men: the benefits of red wine, from the Harvard Men’s Health Watch, 2007)Though drinking wine to cure cancer might seem like the best thing ever, it is more advisable to consult with a doctor as alcohol is generally considered to cause cancer. Raise your glasses for a longer life. Literally. A study at Harvard Medical School has found conclusive evidence that the resveratrol present in wine promotes longevity. It activates a protein within our bodies which revs up the mitochondria in our bodies, protecting us from diseases. All these fancy new diets nowadays aimed at making you a healthier person—either focusing on weight loss, diabetes, cancer prevention, or heart health—have wine as their common component. Wine is definitely doing magical things inside our bodies. With all these amazing health benefits in mind, drinking your glass of wine after the day’s end is going to be all the more enjoyable. Keep in mind not to overdo it as even with all its wholesome properties, wine contains alcohol which can never be good for you in excessive amounts. Now raise a toast to your health and drain your glass! (2007). Attention men: the benefits of red wine, from the Harvard Men’s Health Watch. Harvard Health Publishing. David J McLernon, J. J. (2012). Do lifestyle choices explain the effect of alcohol on bone mineral density in women around menopause? The American Journal of Clinical Nutrition. Mr. Gepner, D. G. (2015). Effects of Initiating Moderate Alcohol Intake on Cardiometabolic Risk in Adults With Type 2 Diabetes: A 2-Year Randomized, Controlled Trial. Annals of Internal Medicine. Neafsey EJ, C. M. (Moderate Alcohol Consumption and Cognitive Risk ). Moderate A. US National Library of Medicine. Woznicki, K. (n.d.). How red wine helps the heart. WebMD. Zelman, K. M. (n.d.). Wine: How much is good for you? WebMD.